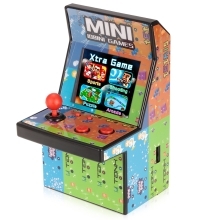 108 built-in nostalgic games bring back the fun of an arcade in this handheld gaming cabinet. Portable, play in your hands for convenience or on a table/desk for gaming stability. Authentic game sounds to enhance play, plus a volume control to make mom happy! Runs on 3 AA standard alkaline batteries for hours of – running, shooting, driving high speed, sports, and education games.